Yesterday I met Elena for lunch at Nordiska. We fixed pizza and ate on the balcony. I played peek-a-boo with her daughter Sonia. It was cool outside, so I turned on the sauna and after I had said goodbye to my friends, stepped in to warm up a bit. Figuring that no one would be outside on such a cold and rainy day, I went out to jump in the lake wearing just my towel. As long as no one’s around, this isn’t normally a problem. But when I got outside, I saw that there was a big party tent on the lawn behind one of the neighboring rowing clubs, and a wedding ceremony was underway! I didn’t want to walk all the way back upstairs just to fetch my shorts—I planned to go running in these shorts later in the evening and didn’t want them to be wet. But I didn’t think waltzing down to the end of the dock and skinny-dipping in full view of the wedding guests was a good idea either. So for modesty’s sake, and so as not to disturb the wedding, I walked over to the shore by Seeclub Zürich, and tried to make a shallow dive into the water there. Unfortunately, I didn't get enough lateral momentum, and although my torso made it to the deep water, my legs dragged along the bottom. I felt the top of my left thigh being scraped by something sharp. It happened so fast, and I didn’t feel any pain. But when lake water began flowing into the wound, I realized immediately that I had received more than just a scratch. I walked out of the water to survey the damage. It was not a pretty sight. There was a twenty centimeter gash on the front of my thigh, running straight upward from just above the knee. As I walked up onto the lawn, the blood began to stream out of the wound, branching out into a tree-like pattern as it flowed down the front of my shin and onto my foot. So then I had the task of walking back to Nordiska with blood running down my leg, covering up with my towel without getting it bloody, and again, without making a scene that would disturb the wedding guests. It was a bit ridiculous. I tracked blood all through the boathouse as I made my way back upstairs. I located the first aid kit in the changing room and stopped the bleeding with a pressure dressing. The situation was stable at this point, but the wound was not going to stay closed by itself. I knew I’d need to get stitches if I wanted to avoid ending up with a large scar. I walked to Bürkliplatz and took the tram up the hill to Universitätsspital Zürich, where within half an hour I had submitted my paperwork, gotten a fresh tetanus vaccination, and had been wheeled on a gurney to an operating room, where I was getting sewn up by a nice Austrian nurse named Veronica. She was friendly, and seemed glad to have something to do. The hospital wasn’t very busy that day. While she worked, I chatted with her and asked questions about what she was doing. I also took two videos with my iPhone. After cleaning the wound, she injected the site with anesthetic. These injections were the only painful part of the procedure. Once the wound site had been numbed, I felt only pressure—no pain—for the remainder of the procedure. Veronica told me she was from Vienna, and that she was here on a temporary internship. She said that she liked the hospital and the city very much, and planned to move here permanently. She was cute too, so after I was all patched up I told her I had enjoyed talking with her and wondered if she might want to keep in touch. The look on her face said it all: “Oh god. Must every man I patch up ask me for my number?” He demeanor changed in an instant. What had previously been a talkative and friendly person became an unresponsive automaton, just doing her job. Having previously told me that she was planning to move to Zürich, she declined sharing her contact information on the grounds that she was “going back to Vienna tomorrow.” Um, yeah. Just say no, okay? I imagined what she must have been thinking: “How nice. Here’s a gentleman—making nice conversation and not even hitting on m—nope, there, he did it. He hit on me.” I guess she hasn’t yet learned how to decline advances gracefully. These things take practice—and a fair amount of mental energy. Oh well. She did an excellent job with the sutures, and for a while at least, we had a nice chat. If I’d made a new friend, it would almost have been worth all the trouble! Pretty!, originally uploaded by Michael A. Lowry. I was in and out of the hospital in less than an hour. The whole process was remarkably efficient, and the experience made my visits to hospitals in Sweden and the U.S. seem poor and haphazard in hindsight. Of course the Swiss level of service comes at a cost—but luckily I won’t have to pay it out-of-pocket. The hospital visit will be covered by my IBM’s accident insurance. Companies in Switzerland must purchase accident insurance for all full-time employees. After leaving the hospital, I returned to Nordiska to pick up my things. I fixed a pizza with the leftovers from lunch, and made my way back home. I had planned to go running with Malin, but obviously that wasn’t going to happen. I called her and explained the situation. “If you planned to go running anyway, then there was no point in getting stitches,” she said. OK! I resolved to take it easy and give my cut time to heal. My doctor friend Linda lives and works in my neighborhood. She met me at the tram stop and came by for a while to check up on me—it was very sweet of her indeed. The wound seems to be quite okay. It’s not painful, and in fact the thing I feel the most is the pulling of hairs by the bandage when I move my leg. The doc told me not to exercise using that leg for at least ten days. My friend Nic had been kind enough to arrange a skiff rowing course for me and some others. A skiff is a one-person rowing boat, and learning to row a skiff requires special training. Since I began to row last year, I had looked forward to the summer when I would have the opportunity to learn to row a skiff. With that skill under my belt, I could row whenever I wanted to—even without a partner. The course was this morning, and obviously I wasn’t able to participate. When I told Nic last night that I wouldn’t make it (and explained why) she told me that it was one of the best excuses she had heard, but that she would want photographic proof of my injury. Hah! If I’m involved, there’s always photographic evidence to be found. Nic agreed to hold a second course for those who missed this one. Thanks, Nic—you’re an angel! 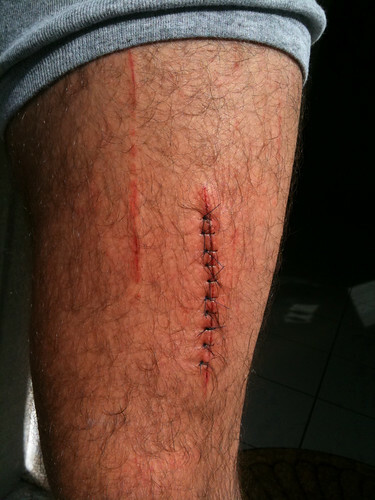 This was my first experience getting stitches. It was interesting and less of a big deal than I had expected. I have since learned that for some minor cuts that might otherwise require stitches, cyanoacrylate (super) glue often works in a pinch. I’ll have to remember to pack a tube of the stuff on my next backpacking trip. Oh dear! Diving into shallow water - tsk, tsk!